New Jersey Sidewalk Accident Attorney | Tomes & Hanratty P.C. Sidewalk accidents can result in serious injury that can impact a person’s life and livelihood. While pedestrians navigate the sidewalks of New Jersey’s towns and cities, they are faced with various hazards that can cause them harm. 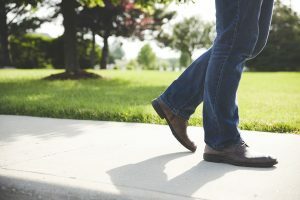 When a person is injured on a sidewalk, they may need to prove the negligence of the property owner responsible for the conditions. In New Jersey, the victim of personal injury must prove their case. It is imperative that you contact an attorney that can construct a strong and viable personal injury case on your behalf. If you need quality legal services from an experienced law firm, contact Tomes & Hanratty, P.C. for a free, initial consultation. The law states that if the owner knew or reasonably should have known about the condition and did not take action to fix the problem, the injured party may have a valid personal injury case. It is important to note that when it comes to weather-related conditions, property owners have a certain amount of time after a storm to free their walking surfaces of snow and ice. If you were to navigate the sidewalk within the allotted time they are provided, you will most likely not be able to sue for damages. In order for you to have a valid personal injury case, you will have to establish the negligence of the property owner responsible for the surface that caused your injury. In many cases, you will have to provide evidence that the condition existed. Firstly, always get medical attention. Medical professionals will document your injury and, generally, the time and place it occurred. If you are able, take pictures of the hazard. If anyone witnessed your injury, speak with them about what they saw and ask them for contact information so they can corroborate your story. If you are not able to act for yourself, contact our firm to come to the scene and collect evidence for you. Sidewalk accidents can leave a victim with serious injuries that can devastate one’s future. If you need an effective attorney to guide you through your legal issue and represent your interests and future, contact Tomes & Hanratty, P.C. For many years, Tomes & Hanratty, P.C. has been there to help clients recover damages caused by the neglect of others. If you are one of the many who have been hurt by another’s negligence, contact Tomes & Hanratty, P.C. for a consultation today.